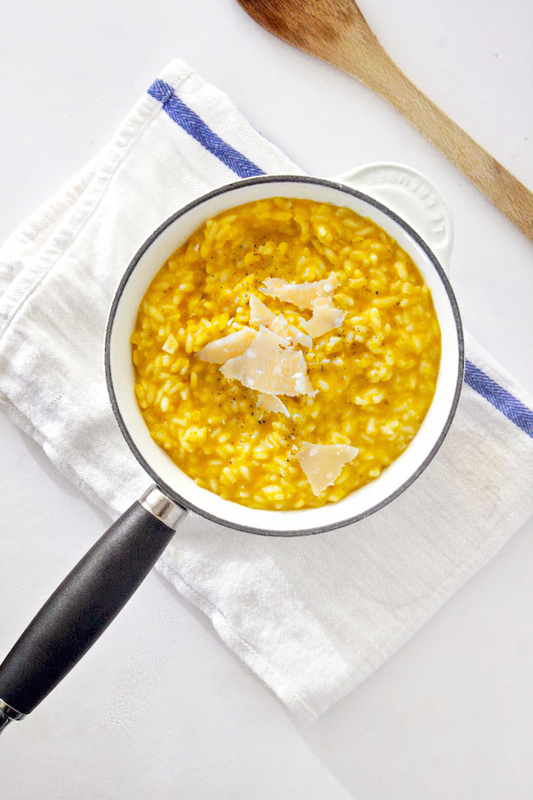 The Ultimate (Easy) Fall Dinner: Simple Pumpkin-Parmesan Risotto! / Hey, EEP! The Ultimate (Easy) Fall Dinner: Simple Pumpkin-Parmesan Risotto! Here's simple fall dinner inspiration, straight from my new post for Refinery29: Easy Pumpkin-Parmesan Risotto (love). Lots of parmesan cheese, cracked black pepper, pumpkin and a splash of cream? You got this! I know some folks find risotto-making a bit intimidation. The thing to keep in mind is this: It's just stirring! If you can stir, you're already a risotto master. I add my broth about 1/2 cup at a time. If you're in a rush, though, you can start adding larger amounts of broth after the first addition or two. It won't really make a difference. 1. Combine the chicken broth and one cup water in a microwave-safe bowl; microwave on high until steaming, two to three minutes. 2. Melt two tablespoons of butter in a skillet over medium heat. Add the shallots and cook three minutes or until soft. Add the rice and cook, stirring, one minute. Add the wine and cook, stirring, until mostly evaporated, about two minutes. Stir in one teaspoon salt and 1/4 teaspoon pepper. 3. Add 1/2 cup hot broth to the rice; cook, stirring, until almost absorbed. Continue adding broth in 1/2 cup increments, allowing it to be absorbed before adding more and stirring occasionally, until the rice is almost tender, about 20 minutes. 4. Mix the pumpkin, Parmesan cheese, heavy cream, and 1/4 teaspoon salt in a medium bowl. Stir pumpkin mixture into the risotto. 5. Remove from the heat. Stir in remaining one tablespoon butter, the lemon juice, and 1/2 teaspoon each salt and pepper. Serve topped with more pepper and shaved Parmesan cheese, if desired. If you're not really feeling risotto tonight, here are a few more of my easy dinner recipes on Refinery29—like Pizza Bianca and French Market Chicken.